How often do you see a viola running down the street, let alone in a half marathon? 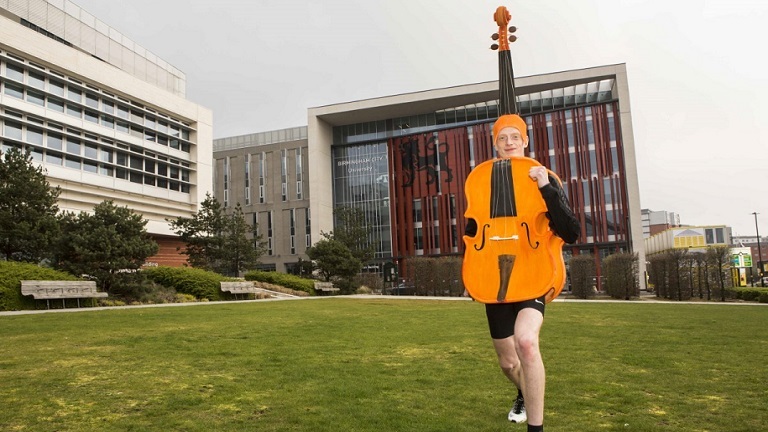 A student at the Birmingham Conservatoire in the UK will attempt a Guinness World Record on April 2: running the fastest half marathon dressed as a musical instrument. Alistair Rutherford will be suiting up in a custom-made viola costume to run the Liverpool Half Marathon in a stab at the world record, which is currently held by Indian runner Rakshith Shetty, who ran the SBI Bengaluru Midnight Marathon in 2015 dressed as a guitar. Rutherford is hoping to raise funds for the UK-South African project, Cape Gate MIAGI Centre for Music & Birmingham Conservatoire – or ARCO – which has seen young string students in South Africa given weekly Skype lessons by academics, students and alumni of Birmingham Conservatoire. The project aims to bring music and music education to children in the most deprived circumstances. Rutherford’s viola stunt is only the latest fundraising event Rutherford has organised for ARCO – he ran the equivalent distance of the length of South Africa’s coastline (2798 kilometres) last year and organised an evening of chamber music at Birmingham’s Ikon Gallery earlier this year. Rutherford’s attempt will be broadcast through Facebook Live on his Facebook page. The viola costume Rutherford will be running in was created by costume designer Brian D Hanlon and is made from Pastazote foam. Formed in 1975, the ensemble presents music that is “dark and depressing, glorious and wonderful”.